Benign paroxysmal positional vertigo — In this condition, a change in head position causes a sudden sensation of spinning. 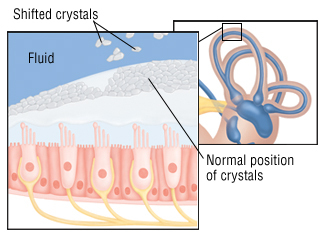 The most likely cause is small crystals that break loose in the canals of the inner ear and touch the sensitive nerve endings inside. 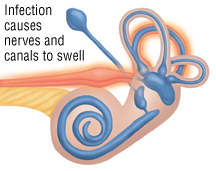 Acute labyrinthitis, also called vestibular neuritis — This is an inflammation of the balance apparatus of the inner ear, probably caused by a viral infection. Ménière's disease — This causes repeat episodes of dizziness, usually with ringing in the ear and progressive low-frequency hearing loss. 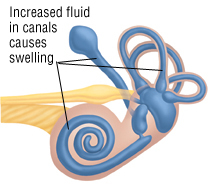 Ménière's disease is caused by a change in the volume of fluid inside the inner ear. Although the reason for this change is unknown, scientists suspect that it may be linked to loud noise, to a viral infection or to biologic factors inside the ear itself. Vertigo can feel like the room is spinning or like you are spinning in the room, or it can be just a sense of imbalance. It may be associated with nausea, vomiting and ringing in one or both ears (tinnitus).